IBPS SO Specialist Officers Main Exam Results Released 2019 @ Ibps.in: Institute of Banking Personnel Selection, IBPS has released the Specialist Officer Main Exam result 2019. Candidates who have appeared in the written examination can check the results on the official site of IBPS at ibps.in. The result will be available for candidates from February 06, 2019 to February 12, 2019. The IBPS SO Main Exam 2019 was conducted on January 27, 2019. The preliminary written examination was conducted on December 26 and 30, 2018 across the country. The result of prelims was out on January 2019. The Institute of Banking Personnel or IBPS has released the IBPS SO result for the Main exam on the official website. The IBPS SO Main results are available on the website, ibps.in. The Institute had announced the IBPS SO result for prelims exams In January first week. As per an official update released earlier on the official website, the SO Main result was expected to be released by late evening today. Candidates who had appeared for the exam may check the IBPS SO result at the official website, ibps.in. Candidates who qualified the prelims appeared for the SO or Specialist Officers Main exam on January 27, 2019. Step 1: Visit the official site of IBPS at ibps.in. Step 2: Click on the ticker rolling on the screen as ;Click to view your results of CRP SPL VIII Main Exam’. Step 3: Enter the registration number and password along with the captcha code. Step 5: Your result will be on your screen. IBPS has released the notification to fill Specialist Officer posts on November 06, 2018 to fill up 1,599 posts of Specialist Officers across the nation. Candidates can check for more details from the official site of IBPS. Through this recruitment, IBPS will select candidates for various scale 1 and scale 2 posts like IT Officer, Agricultural Field Officer, Rajbhasha Adhikari, Law Officer, HR/ Personnel Officer and Marketing Officer. The Main exam assessed the professional knowledge of the candidate and was of 45 minutes duration. For the post of Rajbhasha Adhikari, there was a descriptive paper as well. The marks obtained in the Main exam will be considered for shortlisting for interview and also for the final merit list. Candidates who qualify the Main exam will be called for a Common Interview to be conducted by the Participating Organisations and co-ordinated by the Nodal Bank. IBPS SO Specialist Officers Main Exam, Interview Combined Results 2018: IBPS SO Mains Result 2018: IBPS main exam and interview combined results of Specialist Officers (SO) has been released on the official website of institute. 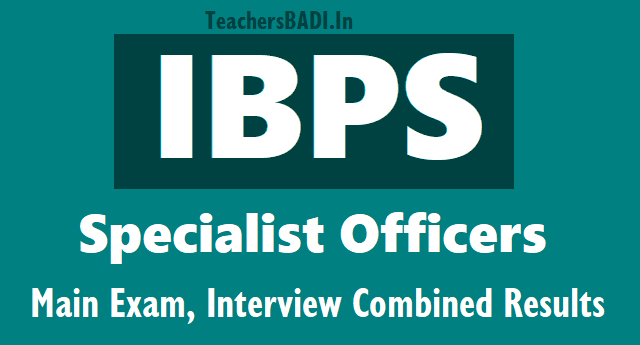 Institute of Banking Personnel Selection (IBPS) has released both the IBPS SO Main and IBPS interview combined results for Common Recruitment Process (CRP) for Specialist Officers at ibps.in. The main exam was conducted on January 28, 2018. A list of candidates (postwise in Registration Number Order) provisionally allotted will be displayed on IBPS website on or before May 1, 2018. However this does not guarantee offer of employment. Decision of Participating organisation shall be final, said a notification from IBPS. Candidates who qualified the preliminary test were given chance to appear in the IBPS main exam. The IBPS SO preliminary exam was conducted on December 30 and 31, 2017. The CRP for Specialist Officers is being conducted to recruit for IT Officer, Agricultural Field Officer, Rajbhasha Adhikari, Law Officer, HR/Personnel Officer, and Marketing Officer in various participating orgnisations of IPBS. Step 3: On next page, click on "Common Recruitment Process for Specialist Officers VII"
Step 4: Click on "Click here to view your combined result for Main Exam & Interview for CRP SPL - VII"
Step 5: On next page, enter registration number/ roll number and password/date of birth along with the captcha given there. Step 6: Click login and see your results. According to the dates given on the IBPS website, the SO results will be displayed till May 1, 2018. Provisional allotment under CRP-SPL-VII has been done based on the post-wise and category-wise vacancies for 2018-19 for specialist officer cadre as furnished by the Participating Organisations subject to availability.